If you ask a Mac user about database software, most will reference FileMaker, the standard for creating business databases. However, FileMaker may be more than what’s necessary for a small business or home user. That’s where Bento 4 comes in. Bento 4 is an easy-to-use, dare I say fun, database application for the Mac, iPad, iPhone, and iPod touch. Recently upgraded, Bento 4 includes many new features users have asked for that make creating libraries in Bento 4 easier than ever. I won’t go into detail here about how to create forms and libraries in Bento 4; you can read about that here in articles written by me and fellow MyMac.com writer Sam Negri. Instead, I’ll discuss the many ways Bento 4 has improved, and how it can help you organize your home or small business. New to Bento 4 is label printing. Not just for addresses, labels can be name badges, inventory tags, anything you need to identify. A very cool option with label printing is inserting an image on the label, for example, your company logo or last name initial. When I tried out this feature it was extremely easy to set up. My only problem was that Bento 4 won’t print the same name on every label. 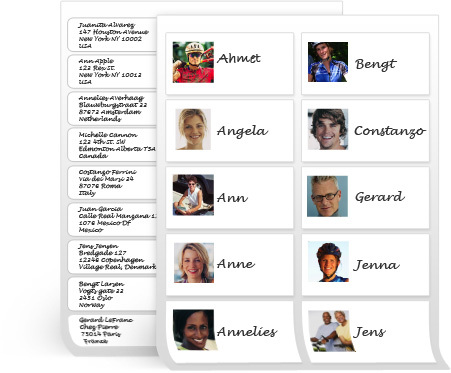 In order to do that I would have to create the same contact 30 times to fill the 30 address labels. Maybe I’m in the minority of users that would need this ability, but it would be nice to use Bento 4, rather than Microsoft Word to create this type of address label. The Bento Template Exchange is a repository of user-generated Bento templates that can be shared around the world at no cost. Now templates can be exported directly to the Bento Template Exchange. If instead, you want to share the template with another Bento 4 user, with or without data, simply export the template to your desktop, then attach to an email. Very quick, very simple. Smart collections, similar to smart playlists in iTunes, are a great way to gather specific records based on criteria you define. As data is added and subtracted from the library the smart collection automatically updates. New to smart collections with Bento 4 is date searching: Is Today, Is Not Today, Before Today, and After Today. • forms can now be locked once they’ve been created exactly as you want them; no more accidentally moving a field, or worse, deleting a field. 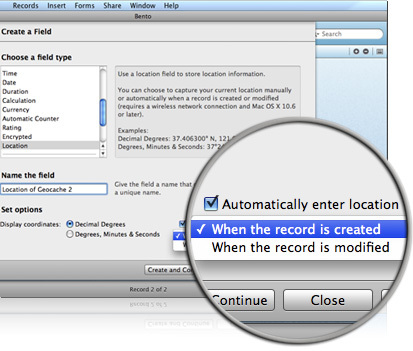 • dragging and dropping media files onto the form creates the field and places the media file within the field. • double clicking on a row number in Table view opens that record in Form view. • easier placement of fields onto the form. • more control over printing forms. • simple lists now include data types. One of the new features that I’ve found quite useful is the message list field. This field stores aliases of email messages, notes or RSS articles from Apple Mail that pertain to a certain record. If you delete the message from Mail the message is also deleted from Bento 4. I created a library of all the MyMac.com reviews I’m working on. Being able to include email correspondence with my contacts directly onto a Bento 4 form makes my work flow much more productive. The emails open in their own window in Apple Mail. Overall, there’s a lot to like with Bento 4. Anyone who already owns a previous version of Bento will be wise to upgrade. Anyone who doesn’t own Bento and likes to stay organized and have fun doing so, will be wise to download Bento 4. 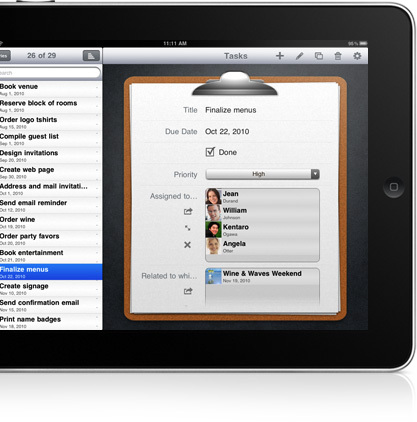 Bento has also been updated for the iPad and iPhone. The big news with Bento 1.1.1 is Voice Memos and Location field. 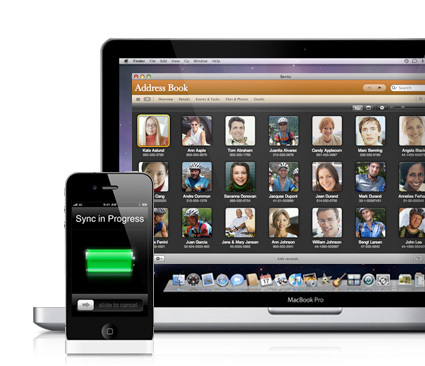 Voice memos is just what it says: you can record a voice message on the iPad or iPhone, which can sync back to your Mac. Unfortunately, you can’t record a voice memo on the Mac version of Bento; you can just play back a voice memo that has been synced. On my iPad, my recorded voice memo sounded sharp and clear, as did emailed voice memos. The Location field, also available on Bento 4 for Mac, captures the latitude and longitude of your location by GPS or Wi-Fi, which is great for users who work in the field and need exact locations with their data. Location works slightly different for iPad, iPhone, and Mac, but all show the location in Google Maps, and allow you to get directions to or from the location. Not everything on the Mac version of Bento is found on the iPad/iPhone versions: for example, there are a few less templates and field choices. But a Library created on a Mac will sync to the iPad/iPhone even if the template isn’t included on the iDevice. Syncing is quick and easy. Not always flawless, but most of the time I continued working with a library once it was synced to another device. Note: when syncing a Library created without a template on the iPad, the fields don’t show up on the Mac form. Be sure to drag them from the Fields box in the lower left corner onto the form. Once you do that, all your data will appear. All fields are on the synced form if a template was used in iPad. I’ve only scratched the surface of what Bento can do. The Bento web site has loads of information, screen shots, and videos of Bento in action. If you still need assistance after downloading, the in-app help for both Bento 4 and Bento 1.1.1 is very thorough and easy to navigate. I’ll be using Bento a lot more, especially on the iPad. It still feels a little clunky on the iPhone, but that could be the due to the size of the iPhone. I love the look of Bento on the iPad; it doesn’t seem like I’m working when using it. As I said for Bento 4, if you want to stay organized, download Bento 1.1.1 for iPad or iPhone. Each can be synced to Bento 4 for Mac or used on its own. MyMac.com rating: 9 out of 10 iPad, 8 out of 10 iPhone.